The Tower Group is a tangled web to unravel at times. The NAIC number for Tower Insurance of New York (a dba) is 44300, and their NAIC Group Number is 3703. CastlePoint National is listed under NAIC 40134. CastlePoint Florida Insurance Company is listed under NAIC 13599. 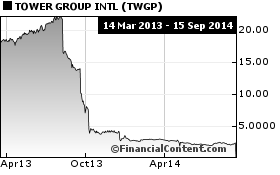 Towergroup was a multi-billion dollar NASDAQ traded company before they came into our field of view. Through investigation it was discovered they had insufficient assets to cover their debt(s) and was in essence a set of shell companies masquerading as a PONZI Scheme. A few interesting maneuvers exposed this and the company was bankrupted under audit, ratings, and SEC scrutiny. Whereas this isn't the most satisfying "win", it did save a number of people from being hurt. Additional information, correspondence, etc on this case is being made accessible on the website, www.FraudDocumentation.com . Lee, Michael Mr. Michael H. Lee currently serves as Chairman of the Board of Directors, President and Chief Executive Officer and has held these positions at the Company since its formation in 1995 and at its subsidiaries since their formation. Before founding the Company�s first insurance subsidiary, Tower Insurance Company of New York, in 1990, Mr. Lee was an attorney in private practice specializing in advising entrepreneurs on the acquisition, sale and formation of businesses in various industries. Mr. Lee received a B.A. in Economics from Rutgers University in 1980 and a J.D. from Boston College Law School in 1983. He is admitted to practice law in New York and New Jersey. Mr. Lee has worked in the insurance industry for over 20 years with experience in insurance, finance, underwriting, sales and marketing, claims management and administration and law. Mr. Lee also served as Chairman, President and Chief Executive Officer of CastlePoint Holdings, Ltd. from its formation in 2006 until its merger into the Company in February 2009. Hitselberger, William Mr. Hitselberger joined the Company in December 2009 as Senior Vice President and became Chief Financial Officer in March 2010. Before joining the Company, Mr. Hitselberger served as Executive Vice President of PMA Capital Corporation from April 2004 to November 2009 and as Senior Vice President, Chief Financial Officer, and Treasurer from June 2002 to March 2004. He also served as Vice President and Chief Financial Officer of The PMA Insurance Group from 1998 to June 2002 and as Vice President of The PMA Insurance Group from 1996 to 1998. Mr. Hitselberger is a Certified Public Accountant and a Chartered Financial Analyst. Abano, Salvatore Mr. Abano joined as Senior Vice President and Chief Information Officer of Tower Group, Inc. in June 2008 . From 2006 to 2008, he served as Vice President of Technology, Systems Development and Infrastructure for QBE the Americas. From 2004 to 2006, Mr. Abano was the Chief Technology Officer in the United States Army, under Operation Iraqi Freedom III, for the central region of Iraq. He was awarded the Bronze Star, Combat Action Badge, and other prestigious awards during his military reserves deployment. Mr. Abano is now a retired Lieutenant Colonel from the military reserves with 26 years of service. Prior to his overseas deployment, Mr. Abano held the position of Vice President and CIO for Kemper Insurance Companies Northeast Region from 1999 - 2004, and was Assistant Vice President of Technology and Strategic Software Development for Munich Re America (formerly American Reinsurance Corporation) from 1993-1999. Mr. Abano has held various positions within the insurance and financial services industry, including with American International Group. He currently serves as Secretary for the New Jersey Chapter of the Society for Senior Information Managers, and was elected in 2006 to the Board of Education within his local community. Mr. Abano received an M.B.A. in Business Management and Technology from Regis University in 2003, and is a graduate of Brooklyn College, The City University of New York, where he received a B.S. in Computer and Information Science in 1986. Orol, Elliot Mr. Orol joined the Company in December 2008 as Senior Vice President, General Counsel and Secretary. Before joining the Company, Mr. Orol served until November 2008 at The Navigators Group, Inc. as Chief Compliance Officer from November 2004, Senior Vice President and General Counsel from May 2005, and Secretary from May 2006. Prior to joining Navigators, Mr. Orol was in private legal practice and, from 2002 to 2003, served as Managing Director and General Counsel of Gerling Global Financial Products, Inc. From 1999 through 2001, he was a partner with the law firm of Cozen O�Connor. He served from 1996-1999 as Vice President, General Counsel and Secretary of the GRE Insurance Group, and from 1987-1996 as Vice President of The Continental Insurance Company. He currently serves on the Board of Trustees of The Dalton School. Mr. Orol received a B.S. in Mathematics from the State University of New York at Binghamton, a J.D. from the University of Chicago Law School and an M.B.A. from the University of Chicago Graduate School of Business. received a B.A. in English. received his B.S. from Drexel University and his M.B.A. from the Wharton School of the University of Pennsylvania. served in a variety of positions at Chubb Insurance Group, including most recently as Senior Vice President and Chief Underwriting Officer of Commercial Lines for Chubb Insurance Group�s Mid-Atlantic Region, in which he managed a $400 million middle-market commercial portfolio in seven states with six field offices and a regional small commercial underwriting center. graduated from the University of Pittsburgh with a B.A. in Economics. Schuster, Steven Mr. Steven W. Schuster has served on the Board of Directors of Tower Group, Inc., since 1997. Mr. Schuster has been engaged in the practice of corporate law for over 25 years and is co-chair of McLaughlin & Stern LLP�s corporate and securities department, where he has been a partner since 1995. Mr. Schuster received his B.A. from Harvard University in 1976 and his J.D. from New York University in 1980.
received an M.B.A. in General Management from Golden Gate University in 1976, an M.S. in Mathematics from Purdue University in 1969 and a B.S. in Mathematics from John Carroll University in 1968. P. Young III, has served as Director of Tower Group, Inc., since 2004 and currently serves as a Director and the Chairman of the Audit Committee of Administaff, Inc and Amerisafe, Inc. Previously, he served as Senior Vice President, Chief Financial Officer and Treasurer of CellStar Corporation from 1999 to December 2001, when he retired. Before joining CellStar Corporation, he served as Executive Vice President - Finance and Administration of Metamor Worldwide, Inc. from 1996 to 1999. Mr. Young also held the position of Senior Vice President and Chief Financial Officer of American General Corporation for over eight years. He was a partner in the Houston and New York offices of KPMG Peat Marwick where his career spanned 22 years before joining American General Corporation. He holds an accounting degree from the University of Texas and is also a member of the Houston and State Chapters of the Texas Society of Certified Public Accountants, the American Institute of Certified Public Accountants and Financial Executives International. Fox, William Mr. William W. Fox, Jr. who became a Director in April 2006, has over 40 years experience in the insurance and reinsurance industry. Mr. Fox was employed by Balis & Co., Inc. and its successor, the Guy Carpenter reinsurance brokerage division of Marsh & McLennan Companies, from 1962 through 1988, and again from 1992 through 1999. Mr. Fox had a number of positions at Balis & Co., Inc., and Guy Carpenter, including President of Balis from 1985 through 1988 and again from 1992 through 1999. Mr. Fox also served as a member of Guy Carpenter�s Executive Committee and Board of Directors, and as a Managing Director of J&H, Marsh & McLennan. Between 1992 and 1999, Mr. Fox was also the Chief Executive Officer of Excess Reinsurance Company. In 1988, Mr. Fox founded PW Reinsurance Management Company (�PW Group�), as a joint venture with Providence Washington Insurance Company (�Providence�) to underwrite reinsurance on behalf of Providence. Mr. Fox was a Senior Vice President of Providence from 1988 to 1989 and was responsible for selecting and overseeing reinsurance intermediaries. In 1989, the Baloise Insurance Group acquired Providence and appointed Mr. Fox President of the PW Group. Mr. Fox has served on several insurance-related boards of directors and is currently the Chairman of the Board of MII Management Group, the Attorney-in-Fact for MutualAid Exchange. Mr. Fox is a member of the CPCU Society and holds a Pennsylvania Property and Casualty License. received a B.A in International Relations from the University of Pennsylvania in 1970 and a J.D. from Temple University School of Law in 1975. Robbie, William Mr. William A. Robbie became a Director of Tower Group, Inc. in February 2009 upon the completion of the merger of CastlePoint Holdings, Ltd. into the Company. Prior to joining Tower�s Board of Directors, he served as a member of CastlePoint�s Board of Directors from January 2006 until February 2009. Since December 2004, he has provided financial advisory services to the insurance industry through his own consulting firm. From November 2002 to November 2004, Mr. Robbie was Chief Financial Officer of Platinum Underwriters Reinsurance Ltd., a property and casualty reinsurance company in Bermuda. From August 2002 to November 2002, Mr. Robbie held the same position at St. Paul Reinsurance, a reinsurance operation of The St. Paul Companies, Inc. From September 1997 to August 2002, Mr. Robbie held various positions at XL Capital Ltd., a Bermuda-based insurance, reinsurance and financial risk company, and its subsidiaries, including Executive Vice President - Global Services, Corporate Treasurer and Chief Financial Officer of XL Re, Ltd. Prior to that, he held a variety of central and senior positions in the insurance industry, including roles as Chief Financial Officer of Prudential AARP Operations, Chief Accounting Officer at Continental Insurance Companies, Treasurer of Monarch Life Insurance Company and various positions at Aetna Life and Casualty Company. From 2005 to January 2008, Mr. Robbie was a director and chairman of the Audit Committee of American Safety Insurance Company. Mr. Robbie is a Certified Public Accountant. Mr. Robbie received his B.A. from St. Michael�s College and his Master of Accounting and M.B.A. from Northeastern University. Smith, Robert Mr. Robert S. Smith became a Director of Tower Group, Inc. in February 2009 upon the completion of the merger of CastlePoint Holdings, Ltd. into the Company. Prior to joining Tower�s Board of Directors, Mr. Smith served as a member of CastlePoint�s Board of Directors from January 2006 until February 2009. Mr. Smith is currently a principal of Sherier Capital LLC, a business advisory firm that he founded in 2005, and a Managing Director of National Capital Merchant Banking, LLC, an investment firm that he joined in April 2008. He was previously Chief Operating Officer (from December 1999 to April 2004) and Executive Vice-President (from April 2004 to August 2004) of Friedman, Billings, Ramsey Group, Inc., where he was instrumental, among other things, in growing Friedman, Billings, Ramsey Group, Inc. from a privately-held securities boutique to a nationally recognized investment bank, helping accomplish its 1997 initial public offering and the creation of an affiliated public company, FBR Asset Investment Corporation, and the merger of the two companies in 2003. Before joining Friedman, Billings, Ramsey Group, Inc. as its General Counsel, Mr. Smith was an attorney with the law firm of McGuireWoods LLP from 1986 to 1996. Mr. Smith currently serves on the Board of Asset Capital Corporation. Mr. Smith received his LL.B. and Dip L.P. (graduate Diploma in Legal Practice) from Edinburgh University, and his LL.M. from the University of Virginia. On a clear August night one of the Tower Group Company's assureds engaged in a type and style of driving (deemed careless by FHP in attendance) that may constitute reckless endangerment and criminal negligence. Tower Group/CastlePoint's assured left a trail of debris on the highway 1000+ feet, and shortly thereafter the Tower Group claims handling team began a similar form of what appears criminal recklessness in their handling of the claim. Fraud, attempted fraud, and good faith violations abound, and it appears to be a matter of business practice within the company. I am not sure if the criminal actions of the Tower Group family of companies under your direction would be considered to be domestic terrorism, but it is likely they border on same. On August 29, 2010 at 0005 hours into the day (5 minutes after midnight) I was in a horrible rear-end collision in which one of your assureds apparently asleep at the wheel in a run-away 18 wheeler at speeds approaching if not exceeding 100mph slammed in to the rear of my vehicle and shoved it a grand total of nearly � mile down the road. Fraud was committed at the scene by the driver/driver company, and the pattern of fraud and attempts at fraud seem to perpetuate in the claims handling process when viewing this claim held up/rejected by Tower Group company, their agents, and subsidiaries. The incompetent and dishonest claims staff, management, and their corporate parent to the insurance for the runaway truck appear to have denied liability for frivolous reasons numerous times, all of which contain or constitute multiple counts of fraud from multiple arms of the organization. The denial copies in the State Financial Services filings have been mailed to myself and others using virtually every type, style, and design of your corporate family letterhead. THIS constitutes federal mail fraud on top of the mountain of legal violations in Florida, New York, and Federal by way of interstate commerce. If the directors were unaware of the reckless behavior of those in and under your employ then let this serve as your notification. You are now (if not before now) party to the violations/offenses/charges. This should constitute at least your second notice. The first private notice was sent to you (and each one of the directors) on March 23, 2011. Example of the correspondence can be seen on www.FraudDocumentation.com . It would appear to me that as a �Director� of a parent company then you have a great deal of input and/or responsibility in the �Direction� of a company. As a result of this filing, additional filings, and filings to come you will see I have adequate documentation to reveal that you and your associates sit atop a corporate structure and culture that teaches and operates a wide array of fraud, attempts at fraud, and patterns of fraud making such deviant behavior not only appears a way of life, but an everyday course of business. It appears that you operate a corporate culture with fraud as a core tactic/strategy. Thus far it looks from where I sit like every single person in your office/system who has had any contact with us or our file is potentially guilty of multiple counts of �Bad faith�, attempted fraud, and/or fraud. Not only has the actions, inactions, and correspondence by way of the corporate officials helped to penetrate the corporate veil, we have in writing correspondence your home office endorsing such bad behavior. As a director of the company it does not take a huge leap of faith to demonstrate you are party to the frauds, patterns of fraud, and corporate culture of fraud. Once you were privately made aware on March 23, 2011, no effort was made to remedy the www.tedwhidden.com> ">problem for the victim. Silence from the board after an appeal from the victim likely indicates an endorsement of the behavior leading to this point. Of course Florida insurance law and ethics mandates you and your adjusters disclose in writing any and all unlawful or criminal behavior which you are aware of. If you or your personnel fail in this area or have failed to this point, then you are party to the crimes. You are on notice. A moral, ethical company or individual would make proper actions to rectify the root problems which have brought us to this point. You and your company are guilty on all charges. This will be made available soon to demonstrate all of this for public viewing and consumption if you wish. Launch of the public resource at www.FraudDocumentation.com will allow the viewing public to access correspondence and file information that was encouraged by your team to keep hidden from view. The conventional legal approach to your abuses would encourage the victim to remain a victim and help you to hide your wrong doings. As a public service we reserve the right to make this public. You are being advised of potential litigation that could affect your stock valuation. Your moves are now subject to SEC investigation. You have been notified in a public forum. As advised to you in our March 23, 2011 notice to each of your board members your actions may constitute an SEC (Securities Exchange Commission) violations on top of the mail fraud, patterns of fraud, etc. This notice will now serve as notice to SEC of same to your corporate activity. You have profited off deviant behavior of others. It is time it stopped. I reserve the right to share the enclosed information, previously shared information, and any/all information I deem fit in regards to this event. Someone, some way, somehow needs to stand up to the devious behavior to which you and your company are subjecting the public. In past cases it was likely not in the best interest of the victim of your crimes to expose the criminal corporate treatment of victims, because the perception was that if they affected the financial well-being of your company there would be no financial reserve to pay their financial reward. Someone must take a stand for humanity. Your operating company�s behavior throughout our incident handling has demonstrated a lack of integrity at every point of contact, and your people have avoided the notices of good faith violations and such. In fact, 2 � weeks after the accident we had advised everyone we were in contact with in your organization that they were in violation of law in their handling of our case. We have acknowledgements from your corporate office in New York, your subsidiaries in Florida, and your claims agents. They not only ignored our desires to quickly and efficiently resolve the loss, but they ramped up the abuses and your claims manager committed fraud (multiple acts) when he introduced himself to us (See filings on John Pecoraro). We have now kept them in correspondence for six months as we sort through the rubble of our lives. Meanwhile your people have continued to solidify their devious and wrongful approaches, and as their errors in each instance fell in your corporate favor each time with the same resultant (No liability in a rear-end collision, with no coverage???????) your culture, patterns, and dishonesty are pretty firmly entrenched. Your head of claims exemplifies the actions and behavior of the group����.To give respect where it is due, we contacted your CEO Michael Lee early on to advise him that if the handling patterns continued, then he would be held liable as endorsing this behavior. Not only did his office respond, they committed multiple misrepresentations in that letter, and put it in the mail!! FEDERAL MAIL fraud AGAIN?! Since then I have copied Michael Lee and his prot�g�/assistant (Lowell Aptman) on about a dozen more electronic messages keeping him fully informed of the continued activity. As you can see we have full endorsement of the horrible behavior from the top to the bottom of your organization, and you are a director responsible for the direction of the company. You will see additional filings this day and prior to this that should shed light on this activity and our pleas and appeals for integrity. Unfortunately, within the first 2-3 weeks following the incident the words �fraud� entered in to describe your claims handling style. At that time your claims staff, claims, manager, Michael Lee, and all those involved at the time were advised to notify your Errors and Omissions underwriters. Often the mention of fraud and/or the advice to contact them should be a warning and should be followed. Not only did the abuses multiply and escalate, but your failure to follow through will likely eradicate your use of E&O as we move forward. Just as your people originally in this loss tried to avoid coverage for your assured by advising �late notification� your E&O will now likely be able to use the same denial to reject your claim. We shall see. As we move forward you definitely want to get them involved, because your failure to this point is likely a violation of your agreement. The criminal activity and/or appearance thereof your company uses is really about saving money, isn�t it? You have profited off these processes and procedures. This could mean a corporate culture of deviants has supplied your lifestyle. Everything you own could be at risk. We find ourselves in a very interesting place. Your unlawful rejection of liability and perpetual abuses of the system are causing a substantial amount of distress to victims����.Review our file. Review my correspondence to those you have employed. In a court of law you haven�t much to hold on to, and with each passing day we have fewer reasons to resolve this prior to arriving at court. With every passing day our case becomes stronger, and yours of course is weaker. Is this what your stockholders invest for? Incompetence? Incompetence and dishonesty at all levels with ever increasing liabilities? This is all about risk management and your group is doing a poor job of it. By now you might be thinking I have a head injury! How perceptive! I do as a result of the horrible wreck your assured put me through. I was run over by an 18 wheeler, and then run over by mishandling of the claim. I am not sure which has produced more abuse, but my days aren�t as good as they once were, and have been getting worse. Doctors indicate my brain damage could be considered permanent at this point and only therapy to cope can be given. Have your people looked in to the nature, cause, and extent of damages? NO! (Failure to properly investigate) Do they know the extent of personal injury, physical damages, etc? NO! Failure to properly investigate a loss is a violation in the state of Florida and your people have failed at each turn. Your claims handlers have left your side defenseless and as advised more than 5 months ago their misbehavior is creating damages and losses greater than the original incident. The largest �wreck� may be your claims handling style and frauds. Documentation of this file is vast. The cries for help, pleas for resolution and/or assistance have been going for more than 5 months. We have been ridiculed in writing by your claims manager, shunned, offended, lied to, deceived, and have no faith in the personnel you have in place. The abuses of your agent may constitute harassment, slander, libel, defamation of character and you/your people should be restrained or prevented from insurance activity until this is resolved and your corporate culture is re-trained. The mental pressures for us have been overwhelming. As director you are responsible for direction; and you and your stockholders have profited from ongoing unlawful behavior. It appears to me that you are part of a 1 Billion Dollar enterprise conducting organized fraud. It seems to be organized crime as a form of domestic terrorism. Can you see this? Your corporate culture repeatedly and purposefully insults and abuses the public EVEN following numerous advices, warnings, and filings to make them aware. We have been pretty tolerant to this point. As it continues the web of deception and the depth of deceit has expanded to the parent. How far should this go? You personally, professionally, and corporately are to be held liable for losses and penalties resulting from activities which have been and which are being unveiled under the Florida Public information system in connection with the incident which occurred at Mile Marker 274, Interstate 10, Near Live Oak, Florida 8/29/2010 at 12:05 am (0005 hours). As stated by your claims agent/manager (who has been promoted following written advices of his devious nature) overseeing your operations, there have been a �myriad of complaints� regarding this incident. All complaints are valid and supported and not a single one has been addressed. This will constitute a MOUNTAIN of good faith violations for which he and your companies are responsible. Rather than address the incompetence and deviance in your management and your group you have acquired, promoted, and sheltered operatives and sub-entities in the criminal activities. We hold you and your stockholders fully responsible for the actions and inactions of those under and connected to your direction. As always, prompt contact to amicably resolve this is everyone�s best option. I look forward to someone of integrity with an interest to stop this train wreck contacting me. This notice extends to all the Tower Group Companies, including but not limited to CastlePoint, SUA Insurance, Tower Insurance of New York, and the myriad of shell companies and LLC's set up apparently to avert financial responsibility for actions and inactions.